Could this really be the ghost of Elvis? Jenna Cage of Northern California was looking up an Office Depot rebate receipt when she discovered the ghostly image of the King eerily manifested on the receipt itself. The detailed features of the eyes, nose, and mouth are unmistakable--could this really be proof that Elvis lives? Could this be the ghost of Elvis? Jenna Cage, 30 was looking up an Office Depot rebate receipt when she discovered the ghostly image of the King strangely manifested on the receipt itself. Jenna recounts the eerie circumstances leading to the discovery of the Elvis ghost. 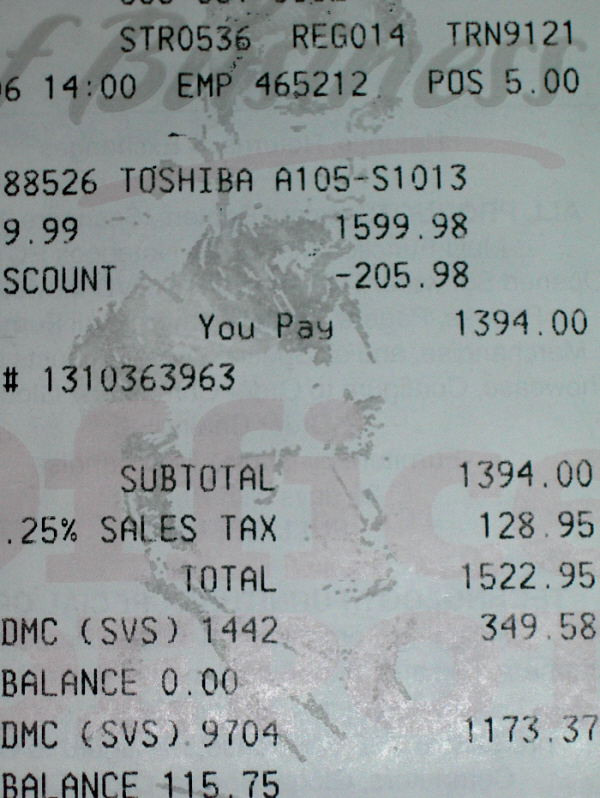 "Last month, shortly after Christmas, I purchased 2 laptops from Office Depot. There was a mail-in rebate offer which I immediately sent in after my purchase. I had not received the rebate check so I got out the copies of the rebate paperwork with intentions to call Office Depot so they can look up the status of my rebate. As I opened the folder to retrieve the original receipt, I almost fell out of my chair! 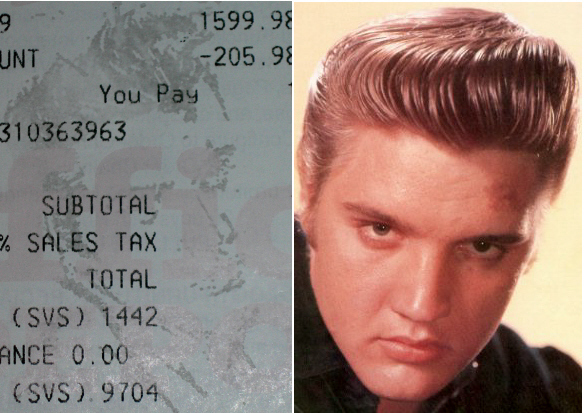 On the receipt (right on top) was an eerie yet unmistakable ghostly image of none other than the King himself, ELVIS PRESLEY! The "ghostly image" contains very clear outlines of ELVIS' eyes, lips, and hair." The question is how did the ghostly image appear or where did it come from? "I am not an Elvis fan", says Jenna. "I have nothing in my house that contains anything that is or connected with Elvis Presley. I have no idea how, why, or where the image came from. All I know is that the receipt is all original, unaltered, and exactly as it was when I got it from Office Depot," she states. The receipt, dated January 12, 2006, coincidentally marks exactly 33 years (the age of Jesus when he died) to the date of Elvis' "Alternate Aloha Concert" taped January 12, 1973 that drew in over 1.5 billion viewers and was the largest, most spectacular concert of the King of rock and roll ever. It also marks 4 days after the King's (would have been) 71st birthday. A journalist doing an article on the Elvis receipt also pointed out a very interesting yet very eerie coincidence that makes this phenomena even more bizarre. OFFICE DEPOT'S SLOGAN: "TAKING CARE OF BUSINESS" (which you can clearly see on the receipt) was apparently ELVIS' signature slogan as well! This gave the receipt's owner Jenna the chills especially since one of the ghostly images appear right on the printed slogan itself. According to the journalist, Elvis apparently took this quote very seriously and even had a "TCB" (TAKING CARE of BUSINESS) diamond logo designed which adorned his rings, necklaces, sunglasses, etc. that he wore to concerts and on an everday basis. Over 200 curious onlookers have viewed the auction in its first few hours. "I've already received several emails commenting on how the images could be anyone from James Dean to Abraham Lincoln", states Jenna. "But the lips---the lips are definitely Elvis", she says.